After kneading, just wash with water. This rolling pin is made of 100% food grade stainless steel. Steel surfaces are not as moldy as wooden surfaces and rupture like rocks. It makes the taste of the dough easy to stick to the drum. DSL Stainless Steel Adjustable Rolling Pin. Importantly rolling pins spacer will be not split and musty after hand-wash. ✪PRFESSIONAL - Owned 17" adjustable French rolling pin for baking, you can say goodbye to uneven cookies, pizza and more. Engraved rolling pin made in Latvia eco-friendly beech wood. Asia Pacific: 1-2 weeks. Australia, New Zealand and Oceania: 3-4 weeks. Mason Cash roller in great shape. To help achieve a perfectly cooked crust， it needs to be of a uniform thickness. The Norpro Pastry/Pizza Roller is the perfect 2-in-1 tool for pies ， cookies and pizza dough! Easy to use on your pastry mat/cutting board or directly in the pan! Pizza Royale ™ Bamboo French Rolling Pin for Baking Pizza Dough/Crust, Pies, Cookies Biscuits. -Made of bamboo wood. -French style rolling pin. - Outstanding Service. 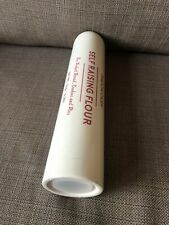 New in box Paul Hollywood 43cm Beechwood Rolling Pin ​*****Trusted eBay since 2001****** Whether you're rolling dough to make pasta, pastries or pizzas, a good solid rolling pin can make all the difference in the kitchen. But when you're rolling dough that needs to be a specific size, you can often be left guessing. That's why Paul Hollywood has partnered with KitchenCraft to create this beechwood rolling pin. It's printed with imperial (inch) and metric (cm) measurements to take all the guesswork out of rolling dough. So whether you’re baking the perfect pizza, or cutting pasta into precise strips, you can roll your dough to the perfect size, every time. It's made of high-quality beechwood. This looks great and holds flour really effectively, so your dough won’t stick. Better still, it’s been tried, tested and approved by Paul himself. It has no handles, as shown. Perfectly balanced for that delicate touch this French rolling pin is tapered at the edges and doesn't have handles. This makes the pin perfect for use in French style pastry making. The dough is pushed outward rather than being rolled flat. 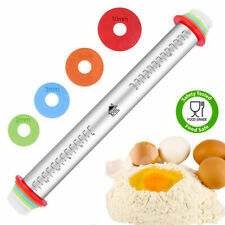 This Rolling Pi n with Adjustable Rings A novice in baking also can make Perfect size. roll it to a certain thickness and press it evenly. A nice kitchen helper & gift for your family and your friends who love baking and cooking; use the rolling pin for rolling dough when you want to make pizza/ pie/ cookies/ pasta/ dumpling/noodles and so on. Engraved rolling pin made in Latvia eco-friendly beech wood. North Africa and the Middle East: 2-4 weeks. Asia Pacific: 1-2 weeks. Australia, New Zealand and Oceania: 3-4 weeks. 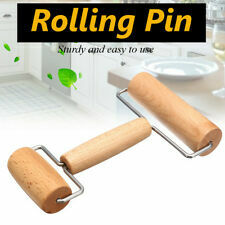 The Chef'n Pin Pair is the ideal 2 in 1 rolling pin solution! It easily converts from a wood French rolling pin to a non stick silicone rolling pin to suit all your baking needs. Measures about 20 1/2" long. New, in box. Of course, the napkin, cutting board and bread are not included!. So bake what you love to eat and have fun with your loved ones. The pin can also be converted to French style by just removing all the discs. The rolling pin is also dishwasher safe, so don’t worry about getting your hands dirty as is the case with plastic or wooden rolling pin. Engraved rolling pin made in Latvia eco-friendly beech wood. Australia, New Zealand and Oceania: 3-4 weeks. Engraved rolling pin made in Latvia eco-friendly beech wood. With a rolling pin I send instructions and a recipe for cookies. Total length: 14.96 inc /38.00 cm. Working length: 7.08 inc / 18.00 cm. Ã‚Â Ã‚Â So bake what you love to eat and have fun with your loved ones. The pin can also be converted to French style by just removing all the discs. Ã‚Â Ã‚Â Ã‚Â. Ã‚Â One thing that ensures the best baking of your favorite food like pies, pizza, pastry, pasta, cookies, noodles or chapatti is the best rolling of the dough. French made professional quality beechwood rolling pin - 40cm. I laser engrave them with a very high precession,and oil them by hand. decorate your pastry! Very nice idea for a gift, not only for bakers ! All rolling pins made in Latvia from eco friendly beech wood. Made in Thiers France - Rousselon Lion Sabatier. The easiest way to roll out thin crusts for pies and tarts. Made from beech wood. Item model number: 01142. Engraved rolling pin made in Latvia eco-friendly beech wood. Total length: 23cm/9”. Australia, New Zealand and Oceania: 3-4 weeks. F r e n c h R o l l i n p i n.
Decorate your pastry! Very nice idea for a gift, not only for bakers ! This rolling pin is engraved with the cools Christmas pattern. Make as gift ! All rolling pins made in Latvia from eco friendly beech wood. French Wooden Rolling Pin 18" x 1.55" for Baking Pizza Pastry Dough, Pie Crust & Cookie - Kitchen Cuisine Utensil Smooth Tools Gift Ideas for Professional Bakers, Restaurants, Grandmas - MR. WOODWARE. Faringdon 40cm Beech Rolling Pin. Traditional Wooden Rolling pin, made of solid beech wood. 40cm (16") long. So bake what you love to eat and have fun with your loved ones. The pin can also be converted to French style by just removing all the discs. Adjust the required thickness with the help of the discs. Ideal for rolling both short crust and puff pastry to achieve your desired thickness. The smooth surface will stop things from sticking and ensure your pastry is flawless, helping you to attain perfect presentation. Color:Multicolor One thing that ensures the best baking of your favorite food like pies, pizza, pastry, pasta, cookies, noodles or chapatti is the best rolling of the dough. So bake what you love to eat and have fun with your loved ones. So bake what you love to eat and have fun with your loved ones. The rolling pin is also dishwasher safe, so don’t worry about getting your hands dirty as is the case with plastic or wooden rolling pin.